What I beheld the early morning of a July day in 2012 from the guest house I was staying at. 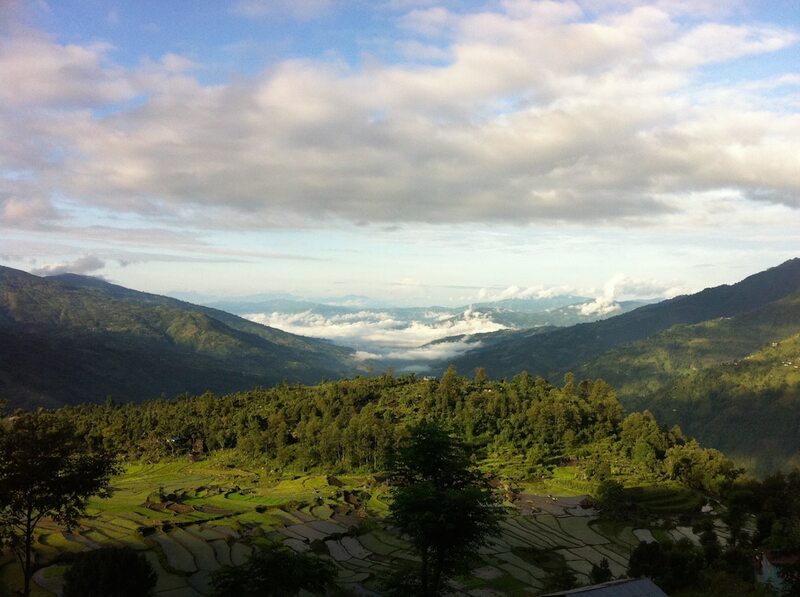 Thangpalkot sits on a beautiful hillside in Sindhupalchok district about 80 km northeast of Kathmandu. But the distance is misleading as getting there can take anywhere from five to eleven hours depending on the mode and/or the combination of transportation. The variously bumpy, rocky and potholed 25-km section of the Melamchi-Bhotang road dug into the sides of hills leading to the village from Melamchi makes the village seem so far; the road, which, even after over five years since the government had first announced plans to construct within two years, is still being worked on. Not a single bridge across the more than half-dozen streams and rivers have even been erected. Distancewise, Thangpalkot is close, really close to the capital and everything else, and yet so remote. The first time I visited the village — in the summer of 2012 — its serenity, peace and beauty charmed me. I still remember the scenery I beheld my first morning there. (See image above.) Looking down Southwest, the fields stretching down below and beyond, bathed in bright mountain morning sunrays, warmth, comfort and a sense of belonging had filled me. I had returned to Nepal that summer for a visit after my first year of working as an international teacher at Qatar Academy in Doha, Qatar. I had accompanied Jayjeev to look at the work COMMITTED was doing in the area. My tentative plans had been to spend another year in Qatar and return home for good, to devote my time to social work. But, I would take a detour. Based on the words of a twelve-year old student at Qatar Academy, I was jailed in Doha, for allegedly insulting Islam. I had no support of any kind — not from my employer (Qatar Academy), not from the Nepalese diplomatic mission and not from the Qatari legal authorities — until the ninth day when a massive international campaign highlighted my plight. On the 12th day I was released and allowed to fly home the following day. In the end, four days of intense international attention was required for my freedom. Most blue-collar workers, mostly semi- and unskilled migrant workers from the Indian Subcontinent — including Nepal — suffer considerably more in Qatar. Most Nepalese workers working on the World Cup 2022 venues in Qatar come from the mid-hills — from villages like Thangpalkot — and the plains. The serenity, the peace and the beauty of the hills masking the harsh realities of life — that of pain and suffering due mainly to poverty. It is poverty, of course, that drives the young men of Nepal out of the country. Millions of 16-45 year-old boys and men from across the country have migrated abroad. Qatar alone is host to 400,000 or so of them. Qatar, where the weather is extremely difficult, where living and other working environments are horrible, where workers’ rights are non-existent and where, instead, a native system called kafala controls all aspects of workers’ lives. The Kafala system, among other things, binds workers to their employers. For instance, workers need to get permission from their employers not just to change jobs, but also to leave the country. Thangpalkot has seen its share of people migrating abroad. Almost half the population of the community of Manekharka in Thangpalkot, I am told, is abroad. In a country where 80% of the population is still engaged mostly in subsistence farming, the absence of those young men are felt acutely everywhere in the countryside, especially during planting and harvesting season. When I visited the area during that season, I would find young school children we, COMMITTED, work with absent from school — their adult guardians having pulled them out of the classroom to help them in the fields. With limited able-bodied men available and demand so high, those willing to work in the fields charge exorbitant daily rates that most farmers cannot afford. The earthquakes of April 25 and May 12, the biggest natural calamity to befall the country in its modern history, has complicated matters even further. There have been reports of Nepalese workers in Malaysia and the United Arab Emirates being given short-term compassionate leave — and even financial assistance with, for example, travel expenses — to return home to conduct last rites, to help with relief and rescue, to help provide emotional and other support to the surviving members of their families and to help in the rebuilding process, etc. Most in Qatar, however, bound by Kafala, have not even been given the option to leave. While the country appears to be doing a number of things to assist Nepal, compassionate leave for the Nepalese men is not one of them. The lack of able-bodied men in the immediate aftermath of the earthquake hampered search and rescue operations since only young children, women and elderly people were on hand. Their absence also meant that relief work was not as effective. Furthermore, the process of resettlement and rebuilding and emotional and psychological recovery from the traumatic experience has been considerably more challenging in their absence. To date, the economic cost of the damage is estimated at almost 50% of the GDP. Ten districts have been severely affected. Over 8,000 have perished, more than two times as many are injured, about half a million have been displaced and over three million have been in some way affected by it. What’s more, aftershock and fresh quakes continue to rock the country, unabated. Monsoon rains threaten to further compound the precariousness of their condition. Villagers, such as those in Thangpalkot, need to begin planting their crops while struggling to stay dry and sheltered from the deluge that will be an almost daily occurrence, once the rains begin. Without the help of the able hands of their young men, food security, which wasn’t guaranteed even before the calamity, is now severely threatened. So, the very young and old, and the women in the distant, beautiful and now considerably more isolated villages in the districts along the central-north belt from Gorkha in the West to Dolkha in the East, are in danger of suffering even more. How much remote and inaccessible must such villages seem to those young Nepalese men trapped in the ‘open jail’ of Qatar, unable to return because of a system that refuses to acknowledge the extreme humanitarian need of the time?! How displaced and powerless they must feel, how much despair they must be enduring?! A lot of that can be eased considerably by the government of Qatar simply lifting the ban on travel of those Nepalese wishing to return home…to the hills, valleys and the plains where they belong…to their country, temporarily at its greatest time of need. The Independent: Nepal earthquake victims’ families prevented from leaving Qatar Fifa World Cup building sites to attend funerals. The Wall Street Journal: Nepalese Migrants Return Home to Face Havoc. The Peninsula: Demand for air tickets to Nepal jumps. Marhaba: Qatar Reaches Out to Help Victims of Nepal Earthquake. But no compassionate leave. The Nepali Times: Migrants Inbound. The Nepali Times: Aftershocks in a migrant economy. NB: I wrote this piece over a month ago but I couldn’t publish it earlier for a couple of reasons. Enjoy your post Dorje. I hope my good Nepalese friend in Doha,Durga, is doing well.